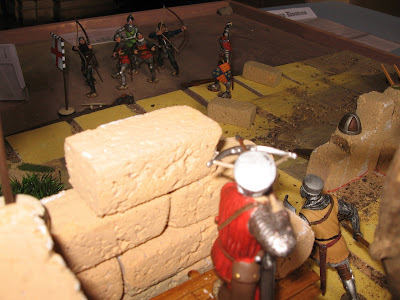 After seven weekends on the road, we had a welcome little late summer break before Newark Irregulars' Autumn show, The Other Partizan ... a generally quieter reprise of the Spring event. 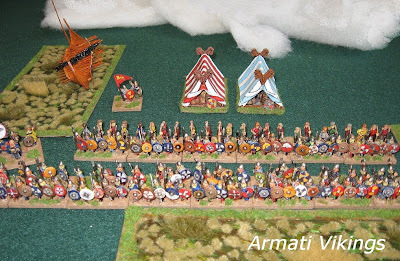 We got there in good time, of course - in time to see Dave Lanchester not set up and wondering how to pitch the Lance & Longbow Society table in our combined Societies pitch :O) For the Society, we were making a return to this year's showgame, Greyhounds in the Slips, now deployed on its dedicated fold-out board (pasting table) ... but awaiting some booster sections to the walls to give the whole thing a bit more (crowd-pleasing height). I suspect these booster sections will meet the public at Derby and SELWG next month. Roll up and play. 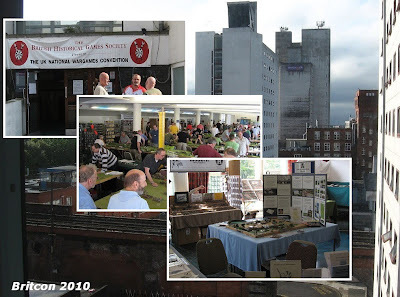 There were quite a few attractive games on display - as ever with a Kelham Hall event - but mostly be played amongst their own exhibitor teams (this tending to be a show where people show up, chat and shop - then go home early rather than stay and play). Nevertheless, as ever, GitS had a few takers, and got some enthusiastic feedback, we took a few memberships and distributed plenty of free sample Slingshots. A good day's response for a quieter midlands show. the number of ancients games in action seems less now than earlier in the year, though the presentation standards of many were exemplary. 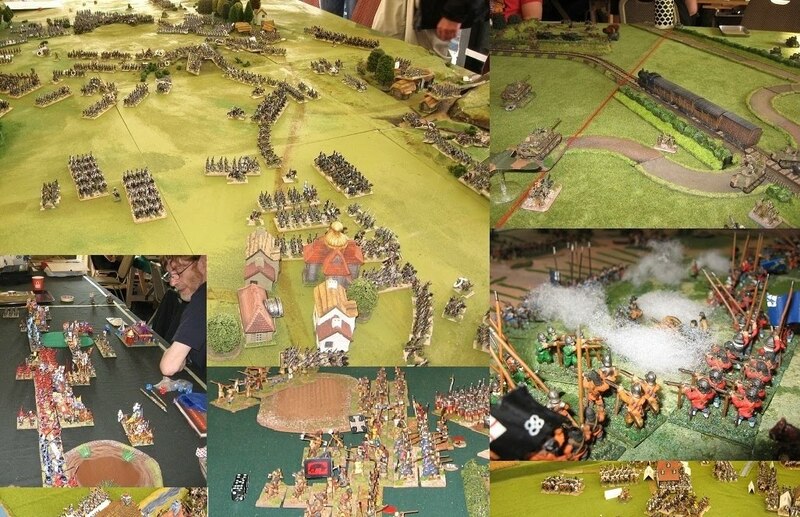 I also got to have a browse around ... the Perry's were doing a Black Powder in the Sudan game, Martin at Peter Pig was demoing Washington's Army, and WD Display Team North were giving a last outing to 'The End' (and I finally got a game). Thanks to everyone for their help as usual, and thanks to the players for joining in. Colours next, where you can join in with a demonstration of Lost Battles with author Phil Sabin on the Saturday, or try out FoG in a Wars of the Roses scenario with Society Secretary David Edwards on the Sunday. I'll be running the stand. 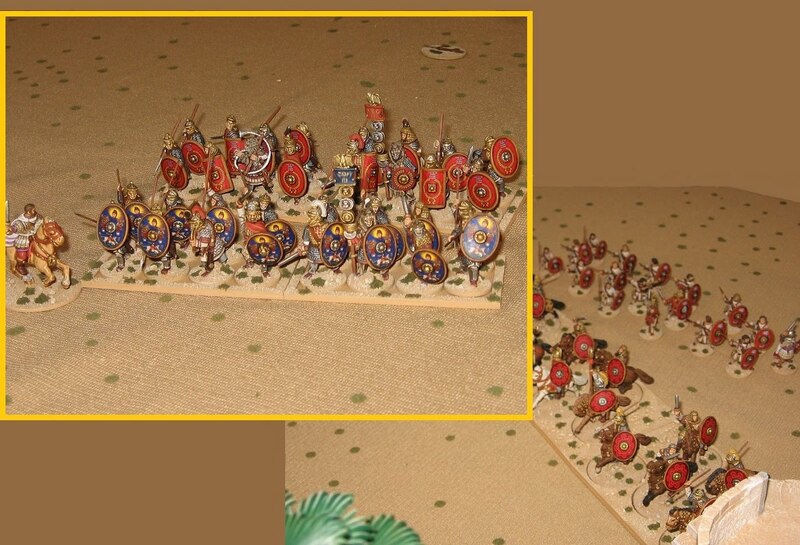 Greyhounds in the Slips returns at Derby and SELWG ... twinning with the Elephant Game (TEITR) at Derby. Unmissable. I guess there's always a lag getting reports posted at this time of year. 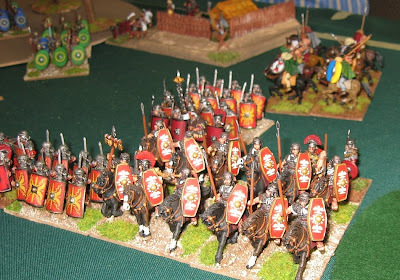 Britcon is the one that's always difficult to write. It's a great weekend, but such a missed opportunity. The UK deserves a great national event, and Britcon, with its wonderfully well-supported competitions, and it's excellent city centre location is a prime candidate to be it. Just as Salute is far and away the best wargames show, and COW the best residential weekend, Britcon has the location and the players. (Britcon - scenes from the show)Sadly, Britcon got itself into a rut some years back and now really only does the tournament side well (and then only if you are a real addict who doesn't want to be troubled by social niceties ...).. I won't dwell on what Britcon does badly ... suffice to say that the Society of Ancients is there as an exhibitor and as the donor of a prize ... as the donor of a prize, we no longer merit much of a mention (more recent comers are more celebrated), and as an exhibitor, we rely on visitor footfall and exposure. 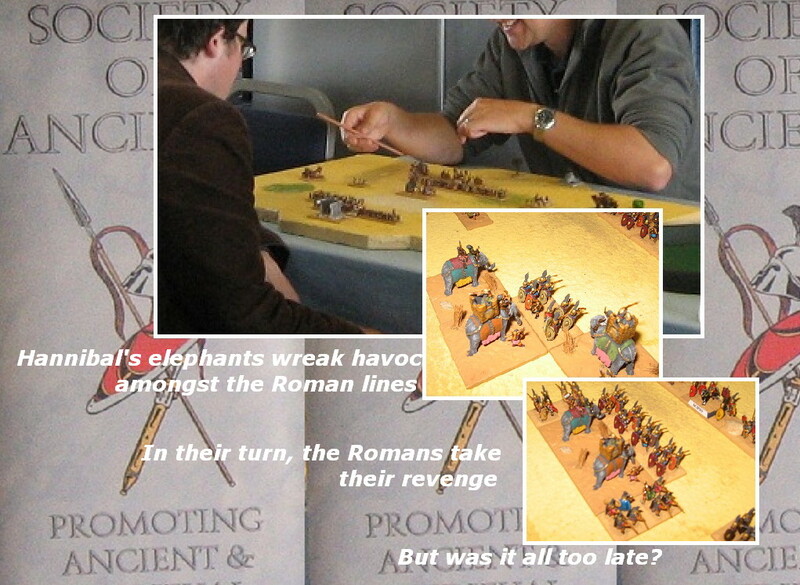 This year, the show - if you can call it that - was screened-off behind a large Slitherine stand so that the few visitors the show now attracts were (so they said) at first unaware that there was a show. This year, rather than end up writing another blog about how annoying never ending wargames can be, played the BHGS way, I thought I'd drop out of the competitions and devote my time over the weekend to promoting the Society full time. So much for that - the response for space to put on games got a pretty hostile reception. 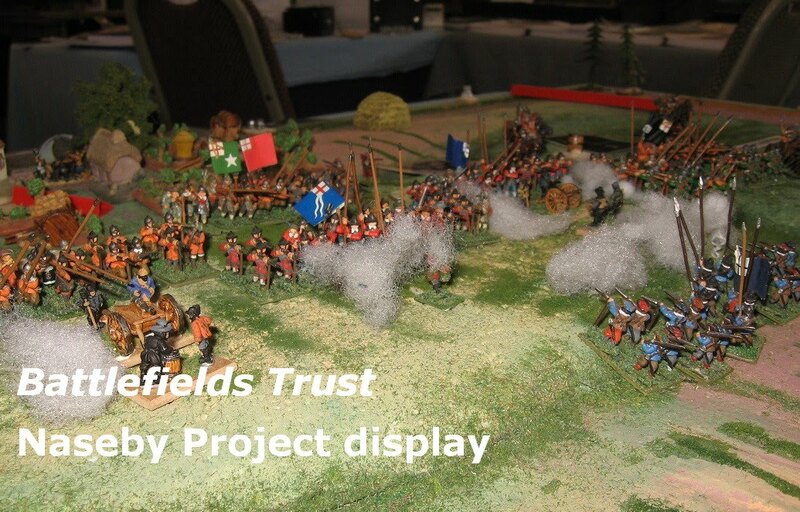 I was able to squeeze in a stand for the Battlefields Trust and I was given a couple of table for the Society gear ... but just in case anyone came - and assuming they found us, tucked away behind the Slitherine stand - I was only able to chat, explain and share samples, not to entertain. 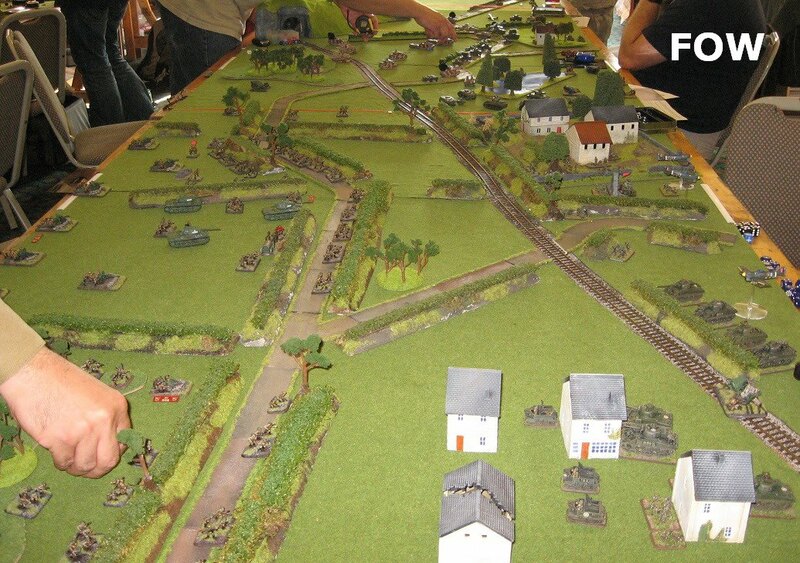 If I had come as a visitor, expecting a wargames show, I suspect I wouldn't be coming back next year. As visitor numbers decline, the BHGS, rather than upping its game, simply shrinks the space it allocates, and so the decline continues. For results of the competitions you can do no better than visit the BHGS results pages. The ancients Armati competition provided an exciting climax, with a dead heat for the Championship between overnight leader Carl Luxford and Karsten Gould ... Karsten very generously deferring to Carl on the basis of count back (Carl had won the game between them) - a tradition within Armati events, but not specifically in the rules for Britcon ... so, shared amongst a select few, UK Armati now has a new national champion. 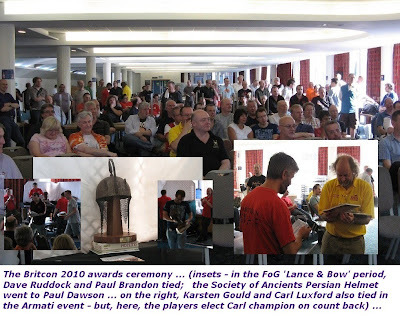 Paul Dawson won the Society of Ancients 'Persian Helmet' trophy. 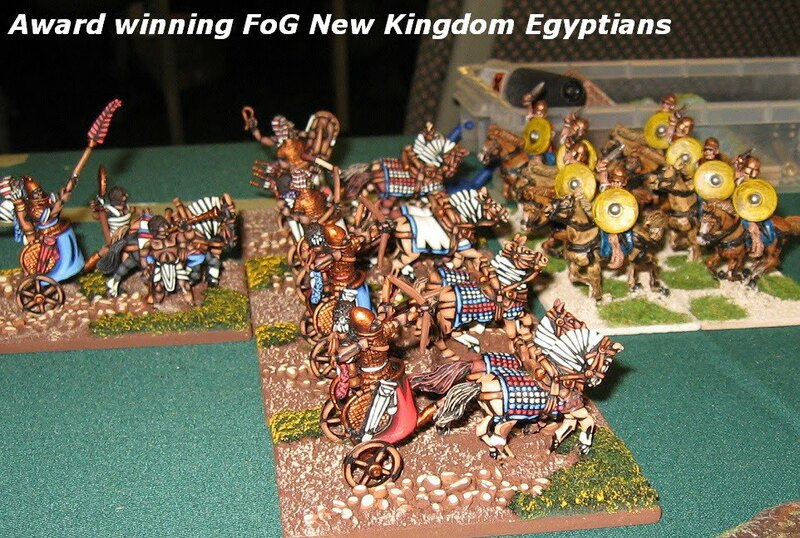 Ian Speed (New Kingdom Egyptian) won the best painted army (ancients) prize. There are prizes for traders but not for exhibitors. 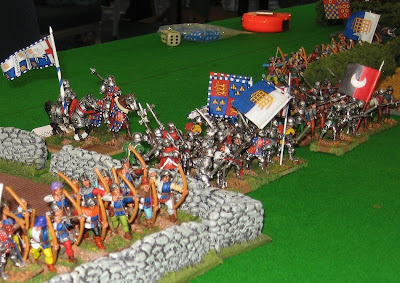 The traders choose the best painted army (it is always a 28mm army, as you would expect ...)..
Next year is a jamboree year as Britcon founder and BHGS supremo Ian ('JD') McNeil steps down after 14 years. Ian has done a fantastic job of creating the event out of almost nothing, and establishing it - as it were - on the world stage. 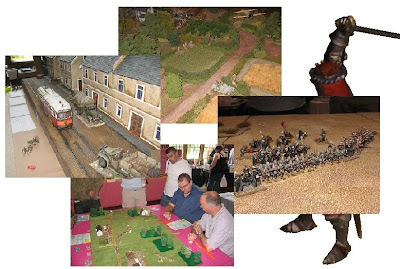 The event needs a new champion who can capitalise on the fantastic base Ian has provided, and take Britcon to the next level ... a fantastic weekend and a great wargames show. It will take some imagination to do that ... but I am sure it can be achieved (and it is what UK wargaming deserves, too)..